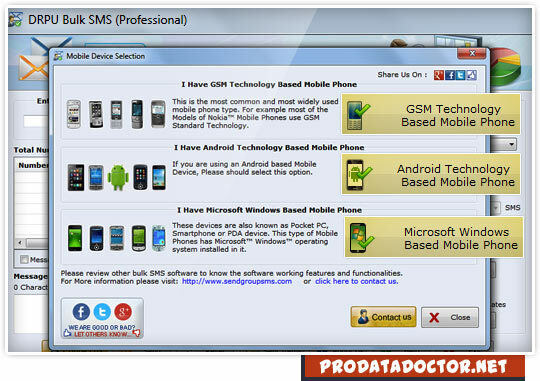 Bulk SMS Software – Professional enables you to send unlimited test messages from computer to individual or list of contact numbers using USB Modem, GSM, Android or Windows based mobile phone. Sms sending program successfully delivers group of text SMS across the world without requiring internet connection. Product launching details, Business campaigns, Share market updates, Reminders , Notifications, Greetings, News alerts, Standard messages and more. ✔ Send unlimited text messages instantly: Bulk SMS software instantly sends text message from computer to single or group of contact numbers over worldwide location using GSM as well as Windows mobile devices. ✔ Broadcast notifications and standard messages: Mobile messaging program successfully delivers notification and standard messages over global mobile network in few easy steps. ✔ Advance delay delivery option: Mobile to pc sms software helps you to control and customized load of bulk SMS while sending group text messages from PC to your global mobile audiences using advance delay delivery option. ✔ Send text messages in different languages: SMS sender programs support all Unicode characters to send thousands of text messages in different languages over global mobile networks. ✔ Saves sent text messages details: Mobile marketing solution successfully saves your sent text SMS details to templates which can be easily viewed by the users whenever requires. ✔ No internet connection is required for sending bulk SMS: SMS message software broadcast text messages in bulk over global mobile network without needing any internet connection.